There is a chill in the air, some of us have seen the first snow of the season, and just about everyone is feeling that wintertime holiday stress… It must be almost time for Midwinter Meeting! Hopefully this issue will help those of you attending the meeting prepare for the variety of SRRT activities scheduled. And for those of you not attending, there is plenty here to keep you informed and aware of not only the business side of the Social Responsibilities Round Table, but the personal side as well. Inspired by Fred Stoss' history of the TFOE which appeared in our last issue, the SRRT Newsletter continues the series by featuring a history of the Martin Luther King, Jr. Holiday Task Force. I would like to extend my thanks to task force chair Virginia "Ginny" Moore for her hard work in preparing this history. It is our intent to continue to provide brief histories of each of the task forces in the coming months as a way to continue celebrating and commemorating the 40th anniversary of SRRT. Another thing you will read about in this issue are some proposed changes to the SRRT bylaws. Some of these proposed changes have to do with the Newsletter and will allow us to resurrect the Editorial Board, an aspect of our organization that went dormant several years ago. In October I posted a general call for volunteers to serve on a new editorial board and subsequently we are submitting five names to Action Council for appointment. They are: Gerardo Colmenar, Librarian, University of California Santa Barbara; Erik Sean Estep, Librarian, East Carolina University; Alison Lewis, Assistant Professor, Drexel University; Heather Stone, Technical Services Librarian, New England College of Optometry; and Julie Winkelstein, Ph.D. Student, University of Tennessee Knoxville. We hope to be adding two additional appointments to the board at Annual Conference in June, so if you are interested, be looking for the call for nominations prior to that meeting. I would like to welcome Jennifer Caldwell as our new book reviews editor. Jennifer is a youth services librarian at Pima County Public Libraries in Tucson, AZ. She is a relatively new member of SRRT and was looking for a way to become more involved. 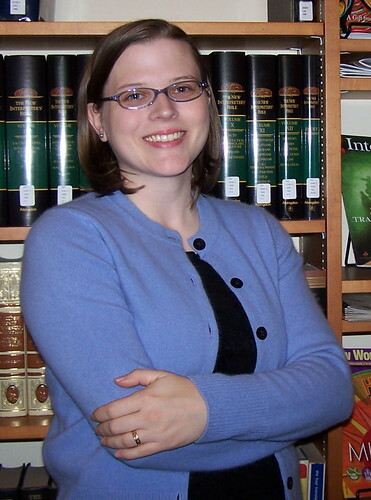 Before entering librarianship, Jennifer worked as a production editor for academic journals, responsible for handling book reviews on a monthly basis. Jennifer is excited about being able to combine her editing skills and experience with her passion for social justice issues and libraries. She worked closely with Jane Ingold, our outgoing book reviews editor, to prepare the reviews for this issue. We are all grateful to both Jennifer and Jane for making this a smooth transition. On a more personal note, I would like to share a special professional accomplishment with you. As some of you may remember, I have a background in theological librarianship and hold masters degrees in both library science and theology. In October, I was commissioned as a deaconess in the United Methodist Church. This marked the end of a ten year discernment and training process and the beginning of an official relationship with my church that unites my passions to serve and to seek out justice through library and information systems. While I have been engaged in such work since 2006, I now have recognition and emotional support from the United Methodist Church. SRRT has been instrumental in my growth as a librarian, broadening my understanding of the relationship between libraries and social justice and challenging me to think in new ways. One of my next projects will be to develop an information services model for immediate implementation in a food pantry and possible adaptation for use in other community service ministries. As I embark on this adventure, the values and lessons I continue to learn from SRRT will be with me, a source of strength and reminder that I am not alone in the quest to bring about justice and equality. As we prepare for Midwinter 2010 in Boston, I'd like to encourage everyone who will be in attendance to join us at our upcoming Action Council (AC) meetings. SRRT will have an action-packed agenda that will include: discussions about budgets, the newsletter and a plethora of other topics. One agenda item sure to engage AC will be a discussion relating to the issues that SRRT have taken on recently. This conversation was most recently initiated by former SRRT coordinator, Rory Litwin, in a Library Juice blog posting. In this post, Rory listed various resolutions recently adopted by SRRT (torture, the wars in Iraq and Afghanistan, and several other topics) and compared them to issues that he felt SRRT should address (privacy, workplace speech, cataloging trends and others). It's important to note that Rory was not suggesting that SRRT shouldn't address topics like war and torture. His argument suggests that SRRT should do more to focus on issues that have a direct impact on librarianship. I would like to know what your thoughts are about this. Please share your thoughts with me. Keep in mind that many of the issues brought forward by SRRT have been initiated by SRRT membership. SRRT members are always welcome to introduce resolutions to AC or the AC coordinator for consideration. And remember that SRRT's involvement in library vs. “non-library” related issues shouldn't be viewed as an either/or proposition. SRRT was founded on the principle that librarians should address issues that pertain to democratic principles and equality for all. And it's imperative that SRRT continue to address these issues. However, it's equally important for SRRT to engage in these exploratory discussions about our work as our mission and goals continue to evolve with the world at large. Rory's blog piece was a great starter and it's my hope that it will serve a learning opportunity for SRRT. As a children's librarian, I believe that a discussion of First Amendment rights as well as the how and why of library use is essential for all young patrons. Banned Books Week is an opportunity to encourage young patrons to really think about the First Amendment, go home or back to school and talk about it. ALA provides tons of materials and helpful information that helps librarians to set up a display. I've done one for several years now. In the week prior to the 2009 Banned Books Week, the Children's Room of Glen Ridge Library in NJ was ready to receive visiting 3rd grade classes from across the borough. 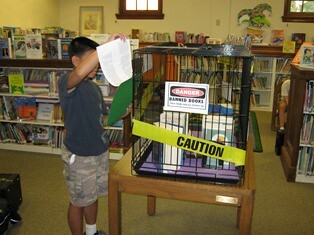 Visible upon entering, 188 3rd grade students, parents, and many more Children's Room patrons saw a large cage holding challenged or banned titles—e.g. A Wrinkle in Time by Madeline L'Engle, Superfudge by Judy Blume, etc. 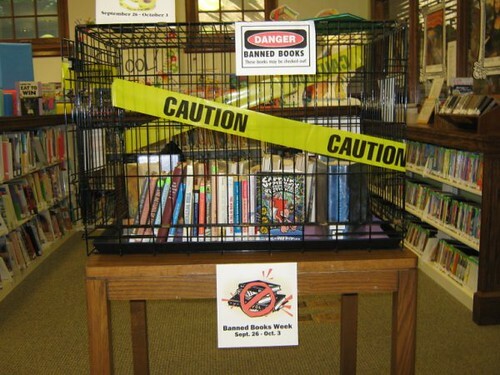 Yellow caution tape surrounding the cage along with signs proclaiming “Banned Books Week” and “Danger: Banned Books” were easy to see. Next to the cage were folders explaining the challenge process, why some books are challenged, and how some challenges end with a book banned and removed from library shelves. Our displays of both children's and young adult titles have done their jobs in attracting attention to challenged books in the US. Each day brought many enquiries about Banned Books: “What does it mean?”; “Why are these books banned?”; and “Why do people want to take these books off of library shelves?” I have received letters from many of the 3rd graders that viewed our most recent display with thoughts such as: "I never knew about this [Banned Books Week], but now I think it is important;" "I am glad to have learned about why books can be banned;" "I never knew about banned books week until you explained it;" and "I learned…more about banned books." These questions and thoughts lead to a deeper consideration of the meaning behind our First Amendment rights and the need for intellectual freedom. I hope my story encourages other children and youth librarians to make displays during Banned Books Week. Kids love learning and asking questions about new and different ideas, and this is a wonderful opportunity to get their minds thinking about rights vs. privileges, what libraries really are to them, and what their own responsibilities are. American Library Association Policy 61, “Library Services for the Poor,” calls on the coordination within ALA of activities focusing on services for and with poor people. While many tribal sovereign nations within the borders of the United States are experiencing a cultural renaissance— including recovery and support of indigenous languages, development of educational curricula rooted in indigenous cultures, and the establishment of local economies—they also face challenges shared with other communities of need. When compared with all households in the United States, more (20.7 percent compared with 11.8 percent) American Indian and Alaska Native households are headed by single females or males (7.5 percent compared with 4.1 percent for the total population). While a larger percentage of Native people have some college or an associate's degree (30.2 percent compared with 27.4 percent of the total population), far more have not completed high school (29.1 percent compared with 19.6 percent) and far fewer have completed a four-year or higher degree (11.5 percent compared with 24.4 percent). Other U.S. Census data point to lower incomes among Native peoples and double (25.7 percent compared with 12.4 percent) the number in poverty. The U.S. Bureau of Indian Affairs' Office of Indian Education Programs releases an annual 'report card' for BIA schools. The latest report for 2007-2008 provides data for 179 schools. These results show that 61.6 percent of students achieved basic reading achievement, whereas 35.6 percent of students were proficient and 2.8 percent were advanced readers. These data provide a snapshot of need and point to areas—especially in reading—where the presence of certified school librarians are known to make a difference. This brief article provides an overview of the joint efforts, initiated by a group of authors called "readergirlz," to include Native teens in National Library Week 2010 activities through an event called Operation Teen Book Drop (OTBD). Readergirlz was launched in March 2007 in celebration of Women's National History Month. This community of young adult authors and teen readers is the top online group for teen girls' literacy. Founded by five women authors in the Seattle area, Dia Calhoun, Holly Cupala, Lorie Ann Grover, Justina Chen and Melissa Walker, readergirlz works to produce monthly e-magazines published through www.readergirlz.com. Readergirlz features a young adult novel and accompanying service project each month via this publication. 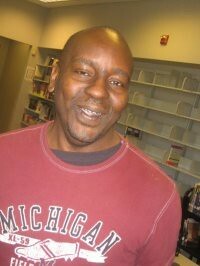 The authors also contribute to a blog (readergirlz.blogspot.com) and support two special literacy projects a year. This online community operates on a very small budget, but has already been recognized for the work they have done to promote teen literacy and leadership in girls, receiving a James Patterson PageTurner award in 2007. In November 2009, readergirlz received an Innovation in Reading Prize from the National Book Foundation. Operation Teen Book Drop is the result of a partnership between readergirlz, Young Adult Library Services Association (YALSA), and Guys Lit Wire. Operation Teen Book Drop is a nationally coordinated effort to get new books to teens in need. In 2008 and 2009 readergirlz delivered over 20,000 books to teens in hospitals to help celebrate Support Teen Literature Day. This year's book drop will take place on April 15, 2010 and will benefit teens attending tribal schools. In June 2009, we began recruiting tribal schools to participate in Operation Teen Book Drop. Early recruitment efforts focused on working with tribal schools with teenagers participating in "If I Can Read, I Can Do Anything," a national reading club for Native students that was launched in 1999 with support from ALA Past President Sarah Long. By the end of August, we had 14 schools enrolled. Currently there are 32 schools with over 6,000 students enrolled in Operation Teen Book Drop. The schools are located in 13 states including Minnesota, Nebraska, Alaska, Wyoming, California, New Mexico, Oklahoma, Washington, Wisconsin, South Dakota, Maine, Hawaii and Arizona. In order to participate, schools must enroll American Indian teenagers between the ages 13-18 and have a local contact to coordinate the distribution of the books. Participation is fairly simple and requires very little on the part of schools. We request a physical mailing address, general contact information, and an estimate of the number of students enrolled at the school. We aim to make sure every teenager gets a copy of a book. Readergirlz has already received donations of over 6,000 new books from publishers. Many of the librarians at participating schools have found space to store early shipments; 3,000 of these books have already been shipped to participating schools for distribution on April 15, 2010. In addition, Guys Lit Wire, an online community promoting literature for boys, is coordinating public purchasing of books via online bookstore websites. Work to support the Operation Teen Book Drop 2010 program included a major revision of the If I Can Read, I Can Do Anything website, which includes the Operation Teen Book Drop website. The primary reasons for the revision of the site were to update the contents, to reorient the site to satisfy the information needs of a more specific user audience, to make the site more accessible and usable by users of mobile devices and accessibility technology, and to utilize Web 2.0 advertising and encourage user participation. Operation Teen Book Drop's Facebook site was updated, advertised, and linked to the main program website. A Twitter site was created to promote more Web 2.0 use and, potentially, to help volunteers and other involved parties stay informed about current activities. For more information about Operation Teen Book Drop, please visit the readergirlz website at http://www.readergirlz.com and the If I Can Read, I Can Do Anything website at http://www.ischool.utexas.edu/~ifican. When the Martin Luther King, Jr. Holiday Task Force was established at the 1999 Midwinter Meeting (New Orleans), it was the culmination of dreams and efforts that stretched back at least fifteen years. It was Mary Biblo, the late Marvin Scilken, and myself who presented the required signatures to Action Council at the 1992 Midwinter Meeting (Philadelphia) to become a provisional task force of SRRT. We were motivated and inspired to continue the work set forth through the loyal and passionate work of many unsung ALA leaders who made significant contributions of time, energy, and finances to accomplish the applauded activities of the National Library Involvement Committee of the Martin Luther King, Jr. Federal Holiday Commission in which the King Holiday Task Force has its origin. The National Library Involvement Committee (NLIC) became part of the American Library Association in 1985, during the presidency of the late E. J. Josey (1984-85). He appointed Hardy R. Franklin (ALA President 1993-94) as the Committee Chair. After a period of dormancy, past president Patricia Wilson Berger (1990-91), in cooperation with the Martin Luther King, Jr. Federal Holiday Commission, reactivated the NLIC and appointed me as her co-chair in 1990. The first meeting of the NLIC was held on June 2, 1990 in Washington, DC and attendees included representatives of public, school, and state libraries in the District of Columbia, Maryland, Virginia, and New Jersey. The second meeting of the NLIC was held at the 1990 Annual Conference in Chicago in President Berger's suite. Through President Berger's inspiring vision, the NLIC focused on ways to expand the observance for additional awareness of Dr. King's philosophy and increase library services in its promotion. The wide range of ALA leaders attending both meetings accepted roles as sub-committee chairs and members. Contributions for the first King Holiday Observance Kit included contents from Prince George's County Memorial Library System, Enoch Pratt Free Library, Brooklyn Public Library, Maryland State Department of Education, DC Public Schools, Chicago Public Library, ALA Federal Librarians Round Table, and the American Library Association. Our efforts were featured in the Winter 1990-1991 issue of Living the Dream: Official Newsletter of the Martin Luther King, Jr. Federal Holiday Commission. The headline read, “Library Committee Prepares Special Kit for '91 Holiday,” while the article elaborated: “The kit was prepared for use by school, public, academic, and special libraries. It can also be useful for churches and community organizations.” The kit was prepared annually and distributed throughout the country, resulting in high applause and great pride for the NLIC because it was a collaborative collection made by individuals in libraries, the ALA, and the Federal Holiday Commission. When the Martin Luther King, Jr. Federal Holiday Commission disbanded in September 1996, the Committee retained its name and activities at ALA meetings to continue production of the King Holiday Observance Kit with the assistance of Carla D. Hayden (ALA President 2003-2004) and Averil J. Kadis (NLIC Co-Chair 1997-2000). Prior to the Commission's close, Certificates of Appreciation signed by Coretta Scott King along with a booklet titled, “Recognition of those who contributed to the success of the National Library Involvement Committee…” were presented at the 1996 Annual Conference (New York). None of the NLIC's accomplishments would have been possible without the leadership and continuing support of Lucille C. Thomas (ALA Honorary Member and NLIC Co-Chair 1993-95), Mary Biblo (SRRT Liaison 1991-1996), the late Marvin H. Scilken (who sponsored the refreshments for meetings from 1997 until his death at the 1999 ALA Midwinter Meeting), and countless others. Immediately following the establishment of the King Holiday Task Force, Satia M. Orange (retired Director, Office of Library and Outreach Services) scheduled the first Martin Luther King, Jr. Sunrise Celebration at the 2000 Midwinter Meeting (San Antonio) with Dr. E. J. Josey as the Keynoter Speaker. From this point to the present, the activities of our task force have made it to the pages of American Libraries, Cognotes, SRRT Newsletter, and other publications, for which we are deeply appreciative. Additionally, we partnered with the Black Caucus to co-sponsor the Sunrise Celebration beginning in 2001. Satia Orange has earned her “praise song” and our profound gratitude for establishing this historic and propitious event that continues in the 2010 preparations with co-chair Andrew P. Jackson and BCALA. In addition, we acknowledge profound gratitude for the co-sponsorship of World Book, Inc. throughout these years. Satia Orange and OLOS also assisted our task force in starting the Martin Luther King, Jr. Holiday Multi-Cultural Idea Exchange at the 2000 Annual Conference. This is a program which showcases representative King Holiday library observances in all types of libraries. At the same 2000 Annual Conference, our task force began its annual participation in the Diversity Fair with highlights of the Sunrise Celebration. Please consider attending the 2010 King Holiday Sunrise Celebration, scheduled to begin at 6:30 a.m., Monday, January 18 at the Westin Boston Waterfront, Grand Ballroom A/B. If you are interested in continuing King's legacy within ALA/SRRT, please contact me by e-mail. I would love to hear from you. 1st Publication/Distribution: The Life of Martin Luther King, Jr.: Moving the Nation, foreword by Joanne C. Burns and edited by Alysia Peich, 2009. Editor's Note: We are happy to bring you the second of two installments of the speeches made at the anniversary party during Annual Conference. The first installment appeared in the September 2009 issue. Chuck D'Adamo: The Alternative Press Center was founded to index underground newspapers like the Chicago Seed, intellectual journals like the Socialist Revolution of San Francisco, and social movement magazines like Women's Liberation Journal in Baltimore—all projects of the New Left. APC has been in four cities at this point, with different founders and anchors in each. The original founders in Northridge, Minnesota, Carleton College were Robert Stigler, Sealy Anne Hicks, and Bill King, anti-war activists in the 60s; the second city was Toronto, and Rochelle College which was a New Left utopian-type college: the anchors there were Kathy Martin, Art Jacobs, and Marti Sheel, again 60s anti-war activists. In the years '74-'75, APC landed in Baltimore, and the anchors there were Peggy D'Adamo, Michael Burns, and myself. Again we were 60s anti-war activists. In 2008 we moved to this wonderful city of Chicago, in a space with our wonderful friends at In These Times and new friends with Area Chicago. And we have a new generation of anchors: Mary Burford, Meghan Davison, and Graham Stephenson. Many radical librarians have been linked to the project: in the early years Jackie Eubanks was a staffer. The network of indexers included James Danky and Tam Dalrymple. Many radical librarians have served on our Board including Shaleen Barnes, Peggy D'Adamo, Jenna Friedman, Karen Gisonny, Montrese Hamilton, Elaine Harger, Marie Jones, Steve Labash, Mark Rosenzweig, and Sean Stewart. Then there's a whole bunch of wonderful people who have served on our advisory committee: Sandy Berman, Sylvia Curtis, James Danky, Chris Dodge, Paula Edmiston, Al Kagan, Elinore Krell, Toni Samek, Polly Thistlethwaite, Wendy Thomas, Dan Tsang, Jane Wiles, and Charles Willett. Bernadine Hoduski: Hi, I'm Bernadine Abbott Hoduski. I've been around since the beginning of SRRT. The resolution to set up SRRT passed ALA Council in Kansas City in 1968, my first ALA conference. My Missouri colleague Bill DeJohn from the Missouri State Library told me that there was going to be an exciting resolution to establish a new organization at the Council meeting and that I needed to be there. I was not able to go to the ALA conference in Atlantic City where the first meeting of SRRT was held but I got a blow by blow account from Bill DeJohn and Joan Goddard. They told me that my University of Denver Library school colleague Phil Imroth had also joined SRRT. I went to the next meeting in Chicago and when we Missouri librarians returned to Missouri we started a chapter of SRRT. I was elected the first coordinator. I was told that I was elected because, even though I am a revolutionary, I look innocent (laughter). I did not dress like a hippie back then and never have, but I'm probably more revolutionary than most hippies ever could imagine. It was a great experience. The reason I started going to ALA, besides Bill and Joan urging me to, was I wanted to persuade ALA to censure the Missouri State Library for firing Joan Bodger for writing a letter to the newspaper saying she would include the University of Missouri student newspaper in the children's collection at the state library. The newspaper had a drawing of the statue of liberty being raped by a policeman on the front page. This was a revolution in Missouri. Many people in the East did not think that we have revolutions in places like Missouri, but we do and every campus in the state was in an uproar against the war, against ROTC, fighting for free speech, civil rights. These issues were coming to a head. ALA ended up censuring the Missouri State Library and that case along with several others inspired ALA members to work for a unit to defend librarians involved in censorship issues. The Freedom to Read Foundation was the result. Most of the SRRT members walked out of the meeting when FTRF was voted for because they did not think the organization would be strong enough and because it was not a part of ALA but set up as a separate organization. If you are not going to be a librarian you should be a lawyer so you can sue people to protect free speech. The founders of SRRT were Bill DeJohn, Pat Schuman, Mitch Freedman, Joan Goddard, Ilse and Eric Moon, Carolyn and John Foreman, John Berry, Norman Horrocks, Arthur Curly, Joan Marshall and many more. I think we probably functioned like you do. We would get together every night and plan our strategy for the next day. Our first goal was to open up the meetings, because you could not attend a committee meeting without permission from the chair. My job was to go to all the Intellectual Freedom Committee meetings and lobby for the censuring of the Missouri State Library for firing Joan. SRRT worked to democratize ALA because at that time it was a very exclusive organization. We then persuaded ALA to come out against the Vietnam War. That was an exciting night (Council used to meet at night). We pinned peace signs on the back of everyone who would let us. When they stood up at Council and membership meetings we said they were standing up for peace. Pinning on the signs was an education for me. Most of the policeman, brought in to make sure we did not cause any trouble at the meetings, allowed me to pin a peace sign on their backs. Some of the librarians refused. I told the ALA executive director that bringing in policemen to keep out the trouble makers would not work since we were all members. Right now we are in two wars and need SRRT to continue to be activists against these wars. SRRT needs to continue to agitate for social justice. Many are not aware that units such as the Government Documents Round Table came out of SRRT. We started as a task force on CIP (Cataloging in Publication) and government documents, progressed to a task force on government documents and then became our own round table. As an SRRT task force we persuaded the Library of Congress to put the Superintendent of Documents classification numbers on the catalog cards. Up until then it was difficult to tell if the cataloging related to a government document. The Interdivisional Committee on government documents got ticked off that we had the nerve to encroach on their territory. We argued that we were a membership group and they were a committee. We eventually put them out of business and their members all joined GODORT. GODORT's constitution was based on SRRT's. Thank you all for inviting me. I have been a continuous member of SRRT since its founding and even though I do not make it to many meetings I appreciate your work. I particularly appreciated it when I served on ALA Council. SRRT resolutions force ALA into addressing the difficult issues. The more trouble SRRT makes, the more members you get, so keep it up. The Alternative Media Task Force will get together at Midwinter in Boston during the All Task Force meeting held on Saturday, January 16 from 8:00 to 10:00 a.m. (location: BCEC-Room 153C). At the meeting we will discuss the future of the Alternative Media Reception in light of shortened ALA conferences, the expense of holding events in conference hotels, and the unwillingness of conference attendees to venture far from the beaten track. Possibilities for new directions include merging our event with the efforts of other groups and building alliances with various ALA divisions and round tables to make sure the alternative media have a place at the table. Last summer's successful ACRL and YALSA Small Press Programs—the former, “Building 'Balanced' Collections,” a panel discussion that attracted more than 50 attendees, the latter, “Strengthen Your Collections with Small Press/Diverse Publishers,” an open house that brought around 100 young adult librarians to view the works of more than 20 book publishers and media distributors—points to the possibility of working with others within ALA to increase the visibility of alternative media. E-books and print-on-demand publishing has made it easier to publish outside the corporate mainstream. There needs to be a way to highlight the best of culturally diverse and progressive media. Perhaps a “best books” list would serve as a productive new direction for the Alternative Media Task Force. These are all items on our agenda. Whether or not you can attend the meeting, if you have additional ideas or items you would like us to discuss, please join the AMTF listserv, and/or contact Lyn Miller-Lachmann, Chair of AMTF. And we are always looking for volunteers. If you'd like to volunteer, please let me know if you're interested in event planning, working with other groups within ALA, implementing an award, or any other idea. I hope to see you in Boston and look forward to hearing from you in any case. The Feminist Task Force had very successful meetings and programs at the July 2009 ALA Conference. The notes from the meetings can be found at http://ftfinfo.wikispaces.com/MINUTES. Work on the Study Project on gender representation in ALA presenters is well underway with people researching several years of programs from past ALA Conferences. The Amelia Bloomer Project had a great breakfast program and the members of the committee are now actively working on the next list. The movie program with movies from Women Make Movies was well attended. The movies were very interesting and thought provoking. It was a fun evening. Plans for the 40th Anniversary of FTF program for the June 2010 ALA Conference are well underway. Meetings: We have two regular FTF meetings at the ALA 2010 Midwinter Meeting. The first meeting will be part of the SRRT All Task Force meeting held on Saturday, January 16 from 8:00 to 10:00 a.m. (location: BCEC-Room 153C). Women in middle management to upper management—how few? What support and encouragement can we give to women to get into these positions? Midwinter is when the Amelia Bloomer Project finalizes the annual list. Anyone interested in seeing how the committee works is invited to attend any of their meetings. They will be meeting Saturday, January 16 from 1:30-6:00 p.m., Sunday, January 17 from 1:30-6:00 p.m. and Monday, January 18 from 1:30-6:00 p.m. All of these meetings will take place at the OMNI-Hawthorne. Feminists Night Out: We are working on final plans for Feminists Night Out. This is just a fun event held on Friday evening around 7:00 p.m., near the beginning of the Midwinter Meeting. It is an opportunity for anyone interested in FTF, WSS, COSWL and others to get together informally and get to know each other and share what will be happening at Midwinter. We try to meet in a woman owned bookstore, independent bookstore, a woman owned business or someplace similar to these. We will know the location in early December. The final time and location will be announced in our list of meetings of interest to FTF members and friends, which will be distributed to many discussion lists a few weeks before the Midwinter Meeting. Stay tuned! At the Annual Conference of ALA this year (2009) members of the International Responsibilities Task Force wrote the “Resolution on Libraries and the Continuing Wars in Iraq and Afghanistan.” It was passed unanimously by SRRT Action Council and then by the ALA Membership Meeting by a large majority of members voting. However, the ALA Council defeated it by a large margin despite having passed a resolution calling for the withdrawal of the US military from Iraq at the 2005 Midwinter meeting. SRRT Action Council also endorsed, with introduction by IRTF, the Free Gaza Movement's Right to Read campaign, which involves running the Israeli blockade to deliver books to Gaza. I wrote in my report after the 2008 election that it would be interesting to see if the new administration would make any significant changes to foreign policy. For example, Obama had promised to close the prison camp at Guant�namo. Now that we have seen that a substantial thrust of this administration’s foreign policy is to step up the long war in Afghanistan, it is clear that a significant part of our attention should be turned to informing ourselves, other librarians and the library users we serve about the issues involved. We are planning for a program on Afghanistan to be held at ALA Annual Conference in Washington D.C. The program is in the 4 to 5:30 slot on Saturday, June 26. Along with other task forces of SRRT, we will be meeting at the All Task Forces meeting at the Midwinter meeting in Boston on Saturday, January 16, from 8 am to 10 am, followed by a SRRT Action Council business meeting. If you have never been to a SRRT meeting, you will be very welcome to come and see what all the task forces are doing, and join in. Do you have any specific international concerns you would like us to discuss? This will be an excellent opportunity to let us know, and to find out what we are interested in and how we work. We will be talking about the planning for our program about Afghanistan. We also expect to be discussing upcoming programs for Midwinter or Annual 2011. IRTF has a low-traffic email list. You can find it at http://lists.ala.org/sympa. Search for SRRT. Alternatively you can e-mail me: jglasby(at)sfpl.org if you want to be added. The selection of the 2010 bibliography of recommended gay/lesbian/bisexual/ transgender books/questioning books for young readers from birth through age 18 is rapidly arriving. At ALA Midwinter, the nine project members will deliberate on almost 70 books to prepare this third annual list. Meetings are all at the Omni Parker Hotel in the King Room. They are 1:30-5:30 p.m. on Saturday (1/16), 10:30 a.m.-12:00 noon and 4:00-5:30 p.m. on Sunday (1/17), and 8:00-10:00 a.m. on Monday (1/18). Observers are welcome. This year’s nominations include fewer picture books than in the past but a new entry into board books for pre-kindergarten: Leslea Newman’s Daddy, Papa, and Me and Mommy, Mama, and Me. Only 14 of the nominated books are nonfiction, and all these are published for adults rather than young readers, showing a serious lack in these materials directed toward a younger audience. On the other hand, the task force has one-third more books to consider than it did last year with the bulk of the fiction published for teens. Also, one-third of the books on the nomination list come from small presses, showing the importance of these publishers in their contribution to GLBTQ books. The task force plans a Sunday breakfast at ALA Annual in Washington, D.C. that includes top author speakers and a raffle of past Rainbow books. More information about the task force, including past bibliographies and currently nominated books, is at www.rainbowlist.wordpress.com. Other sources of information are http://www.myspace.com/rainbow_list, http://twitter.com/rainbow_list, and http://www.facebook.com/group.php?gid=48654643189. The Rainbow Task Force is a joint project of SRRT and the Gay, Lesbian, Bisexual, Transgender Round Table monitored by OLOS. Members are Nel Ward, Chair (Oregon); John Andrews, Vice-chair, Washoe County Library System (Nevada); Michael Cart (Indiana); Lynn Evarts, Sauk Prairie High School (Prairie du Sac, Wisconsin); K.T. Horning, Cooperative Children's Book Center (Wisconsin); Arla Jones, Lawrence High School (Kansas); Michael Santangelo, Brooklyn Public Library; Victor Schill, Harris County Public Library (Texas); and Laurie Spurling, Schlessman Family Branch Library (Colorado). Christie Gibrich, Bowles Life Center Branch/Grand Prairie Public Library System (TX), provides support including public relations and technology. TFOE will participate in the SRRT All-Task Force Meeting at the ALA Midwinter Meeting on Saturday morning, prior to the SRRT Action Council I Meeting. The Task Force on the Environment has no plans for discussion groups at the Midwinter Meeting in Boston. There is a special program to which I would like to encourage you to attend. The Eleventh Annual Arthur Curley Memorial Lecture will be held on Saturday, January 16, 2010, from 1:30 to 3:00 p.m. and features former Vice President and 2007 Nobel Peace Laureate, Al Gore. Mr. Gore wrote a sequel of sorts to his award-winning and attention grabbing 2006 book, An Inconvenient Truth—Our Choices: How We Can Solve the Climate Crisis—which further explores the situation and its causes, and what we can do to alter the effects moving forward. With his follow up book, former Vice President Al Gore takes a deeper look at the climate crisis and what we need to do in order to save the earth from impending doom. This platform will get librarians talking and more importantly involved, as well as will appeal to today's socially conscious youth as we take an even closer look at our planet in peril. The SRRT Bylaws were last amended in April 2005 by ballot. Their full text is available at http://libr.org/srrt/bylaws.html. We propose the following revisions to establish an office for coordinator-elect, to update SRRT Newsletter organization and policy-making structures, and to generally update and clarify language within the document. These revisions must be voted on by the full membership. When and how this vote will occur will be discussed at the Midwinter Action Council meetings. Suggested changes are shown as additions and deletions. The 10 elected members of Action Council shall be elected by mail ballot procedures outlined below and shall take office immediately following the Annual Conference. At the final Action Council meeting of the Annual Conference, the incoming Action Council will meet under the auspices of the outgoing Council to select a coordinator-elect, treasurer, recording secretary, exhibits coordinator, and a membership/recruitment chair. At this same meeting, Annual Action Council second meeting, the previous coordinator-elect will be recognized as the new coordinator and take office upon adjournment of the ALA Annual Meeting. These officers will preferably be elected from the at large members of Action Council, but may be selected from the Task Force representatives or the affiliate representatives. Except in extraordinary circumstances, no single person shall serve Action Council in more than one of the six designated offices. The editor of the SRRT Newsletter shall serve by appointment of Action Council on recommendation of the SRRT Newsletter Editorial Board or other body responsible for reviewing applicants. The newsletter editor shall serve a term of 3 years and may be reappointed for one additional term. The editor shall be considered an ex-officio member of Action Council. An editorial board of 5 to 7 members shall serve by appointment of Action Council on recommendation of the newsletter editor and already appointed members of the editorial board. Whenever possible, the editorial board should be selected from members of Action Council. If Action Council members are unavailable to serve, the editor may nominate members from the SRRT membership to Action Council for approval. The term of office for members of the editorial board shall be 3 years, with the option to be reappointed for an additional term. An editorial board member may not serve more than two terms consecutively, but may be reappointed to the board after 3 years off. Editorial board appointments will be staggered on a 3-year rotation, such that approximately 1/3 of appointees shall turn over annually. The editorial board will advise the editor upon request on matters of editorial policy. The responsibilities of the newsletter editor, the editorial board and other editorial staff shall be established in the SRRT Newsletter Editorial Policy. Changes to the SRRT Newsletter Editorial Policy shall be submitted to Action Council for approval. It should be clear how Action Council is expected to make the appointment of SRRT Newsletter editor. As one of the functions of the editorial board will be to review applications and advise in the selection process, their role in this process should be recognized. All other leadership positions mandated by the SRRT bylaws are either elected or appointed for a term of three years with option to serve one additional term. The newsletter editor should be offered the same options as Action Council members, other volunteers and liaisons. See Part IV, Section 5, Subsection 3 and Part IV, Section 6, Subsection 1. An editorial board is essential for the newsletter to supply well-balanced coverage of SRRT news and issues. For the new responsibilities of the editorial board, it is necessary to add additional members for an equitable share of tasks and to encourage dialogue. 5 members will be appointed in Midwinter 2010, 2 to a 1 1/2 year term, 3 to a 2 1/2 year term. At Annual 2010, an additional 2 members will be appointed to a 3 year term. At Annual 2011, the first 2 members appointed to a 1 1/2 year term will be up for replacement or reappointment to a 3 year term. All appointments hereafter will follow in this manner. Because of the larger size of the editorial board, it is not practical to expect that members be selected from Action Council members. Action Council members are encouraged to volunteer for appointment to the editorial board, and it is likely that Action Council members will serve on the editorial board without this mandate in the bylaws. Added for clarification and style. See rationale 1. Also, requiring a board member to serve the length of an entire term off the board before being reappointed will be a healthy practice for both board and board member. The purpose of the editorial board does not belong in the SRRT Bylaws, but in the editorial policy of the SRRT Newsletter. The actual responsibilities of the editorial board may change over time as the SRRT Newsletter continues to evolve, and adapting an editorial policy to reflect these changes is less disruptive to SRRT business than changing the SRRT Bylaws. Action Council coordinator will take responsibility for coordinating SRRT elections. Individual members who wish to volunteer to serve will submit their names, their statement of concerns about policy and action on social responsibilities of librarians, and a short note listing their professional experience to the coordinator of Action Council by the required date. The coordinator will then be responsible for ballot preparation in accordance with the ALA specifications. The names of all volunteers will then be submitted to the SRRT membership for election by ballot in accordance with ALA annual Spring election procedures. This statement of Organization may be amended by a majority vote of the Round Table in attendance and voting at the ALA Annual meeting, provided notice of the proposed revision has been sent to members and/or printed in the SRRT Newsletter and/or American Libraries at least thirty days in advance. Any personal member may choose to bypass communication with the SRRT Coordinator and send a proposal for revision directly to the editor of the newsletter for printing if accompanied by twenty-five signatures of SRRT members. This constitutional revision will then be published and subsequently voted on. Kodis, Michelle. Turn Me On: 100 Easy Ways to Use Solar Energy. Layton, Utah; Gibbs Smith, 2009. I've read many green guides from cover to cover but I hardly remember their titles, authors, publishers, or any of their suggestions—nor did I want to buy them. After discovering this book, I more fully understand the disconnect I've had with the others. Often, glossy pages with colored photos have interfered with their basic intent. And mostly I'd needed some fun with the facts. This small trade paperback, the third title of an “eco” series published by Gibbs Smith, speaks differently. The book's bold, mossy green sans serif print on cream-colored pages with rounded corners contrasts nicely with its bold, yellow, common-phrase title that fills most of its orange cover. It prompts me to open it often, read its edgy chapter titles, and make use of its many resources to find practical and innovative ways to use solar energy. Both serious and light-hearted, it's a handy guide for anyone who wants to save money, energy, or planet Earth. In the absence of action on the part of governments, hundreds of millions of increasingly climate-conscious citizens can promote low-carbon alternatives by changing the ways they purchase, invest, vote, think, and live. All you need to act is timely, accurate, publicly available information about the choices you face. It's time to take matters into your own hands. And, at just 157 pages, so I can, heeding the author's reminder to “always look on the bright side of things.” I'm prone to reading non-fiction books from beginning to end. However, with this title, I mostly choose tongue-in-cheek headings from the comprehensive table of contents. Or I consult the two very adequate indexes: one general and one organization-specific. Or I read randomly. With lots of white space, a wealth of earth-friendly information shines right through this bright star of a publication. Mr. Pat, The Apostate Theory. AuthorHouse, 2009. The Apostate Theory, a novel published through the vanity press AuthorHouse, advances the idea that the United States is in great peril at the hands of Islamic radicals because “the American President is an apostate and devout Muslims believe he has committed the gravest of all sins in Islam;” the President thus must be punished with death. With this idea as its foundation, the novel chronicles the international adventures of characters involved in the American government and branches of the American military as they work to prevent an Al-Queda [sic] sponsored nightmare worse than the events of September 11. Mr. Pat stresses that the plot of, and terrorist threats and situations highlighted in, his novel could very well be the truth. According to AuthorHouse's Web site, Mr. Pat has “extensive” personal experience with Muslim societies and has written three other self-published fiction and non-fiction books on similar topics. Reading this novel can be likened to reading a controversial Wikipedia article: some content appears to be based in nonfiction but lacks citations, subjectivity abounds, and the continuity of the writing leaps between vastly differing story lines and historical references, leaving the reader confused. One might think the ideas comprising the storyline were borrowed directly from a year's worth of Fox News Channel broadcasts. Lacking are well-developed characters to complement the high-action storyline. It seems the author wanted a rich backstory for each character but did not spend appropriate time developing each. A main character, Ayeza, experienced events early in her life that strongly influence her role later in the novel, but these experiences are presented in roughly one sentence: “The Taliban killed the boy and gang-raped Ayeza.” I can only imagine the author wants the reader to narrowly ruminate over how this event came to be, how it may have affected Ayeza, and how it reflects a negative culture of the Taliban. The entire novel promotes this guided reflection. For some this will be an entertaining read, but the real worth of this novel is that it represents a very real American population's perception of the current political, religious, and social climate of the Middle East. The truths, inaccuracies, and biases within The Apostate Theory are for the reader to determine. This book will spark invaluable discussion and critical thinking about the United States' contemporary political and media climate, Western biases, and tendency to fearmonger. The Apostate Theory could have a place in a public or academic library with collections in political science, media studies, religious studies, or Middle Eastern and Islamic studies. Expression = Life: ACT UP, Video, and the AIDS Crisis. Deep Dish TV, 2008. I was 23 years old in 1988, the year that Emjay Wilson wrote the above poem. Three years later, I took my first (but not last) HIV test, and it would be another two years before I truly grasped the enormity of what had taken place in the United States. Many more years would go by before I could come to terms with the fact that for almost two decades the AIDS crisis had been ignored by so many who could have helped. But some people were aware, and they weren't afraid to speak—or yell—truth to power. In the midst of the fear, the fault-finding, and the deafening silence from the White House, there emerged a group that wasn't polite, didn't show respect for their opponents' opinions, and didn't play nice and wait for a more convenient time before help would come. This was a group that cried out, “say no to fear and just say yes to anger.” When this group said “silence = death,” they weren't being dramatic; they were reciting their own experiences. I, along with many Americans, now know the history of AIDS in this country in large part because of ACT UP. Expression = Life highlights the media's biased reporting on the AIDS epidemic (when they actually reported at all), such as their “faces of AIDS” headlines and numerous reports with repeated menacing portraits of gay men. It reminds us that in 1986, California's Proposition 64—if passed—would have added AIDS to the list of communicable diseases, effectively requiring those with AIDS to be quarantined. The film contains live protest footage, such as ACT UP's “Target: City Hall” and their “Stop the Church” demonstration at St. Patrick's Cathedral, as well as their marches and Pride Parades. Seeing the excitement tinged with fear among the protestors is both inspiring and moving. There are compelling educational/performance art pieces, such as Contra/AIDS, which compares the millions of dollars plus the amount of time and effort spent to inform the public of the 1982 Tylenol scare to Reagan's budget for AIDS research: $0.00. On April 18, 2008, a panel discussion with members who were on the front lines of AIDS activism, including original ACT UP members, was videotaped at New York University. An edited version of this discussion is also included on the second disc. Mandatory testing for gay men; moving protest music; Blacks, Latinos, and Asians fighting for inclusion in both support services and leadership roles; biting political satire; sometimes hilarious, sometimes offensive, mostly ineffective public service announcements; Jesse Helms' horrid, anti-gay legislation; and, of course, the 1987 March on Washington…it's all here, compiled in a comprehensive, exhaustively researched, historic documentary. I cannot recommend this documentary too strongly. It is a crucial recount of American history that should be in all libraries: school, public, and academic. Greer, John Michael. The Long Descent: A User's Guide to the End of the Industrial Age. Gabriola Island, British Columbia, Canada, New Society Publishers, 2008. Peak oil is a topic rarely mentioned in the field of librarianship, and yet the repercussions for the future of libraries and librarians will likely be affected irreparably by the attrition and scarcity of fossil fuels. There are several books on the topic of peak oil—the point at which 50% of the world's supply of oil has been tapped, thus leading to the downside of the bell curve slope of its discovery and excavation. I have read just a few, and was amazed and delighted to read such a clear and concise tome about humanity's short 300-year dependence on fossil fuels and the implications of the gradual loss of those resources. The Long Descent is a compendium of Greer's Internet writings over the past several years that he has fleshed out with many new examples and analyses. Citing the brief reality check first caused by the oil crisis/shortage of the 1970s and the reduction in use as well as an increased urgency in (and subsequent abandonment of) the development of alternate energy sources to remedy that crisis, Greer begins by warning that we have lived so long in a “dream of economic and technological expansion that most people take it for granted that it's the inevitable shape of the future.” Greer explores the limits of growth and provides an in-depth explication of the two polarized reactions generally found in modern criticism of peak oil, and by extrapolation the global warming/climate crisis: the myth of perpetual progress versus the myth of imminent apocalypse. Carefully deconstructing these two myths, which I agree are prevalent, he posits a middle approach—an age of deindustrialization over the next several hundred years featuring times of crises punctuated by periods of stability and perceived improvement. Greer believes the long descent will be defined by a catabolic collapse, or in other words, a decline in which society feeds on itself, consuming more resources than it can produce. Although alternate or renewable energy sources such as wind or solar are important, they will never produce the net energy required to replace the energy of coal, gas, and oil—earth's carbon core resulting from millions of years of organic plant decay compacted by shifting pressures and warmed by the sun. Technological innovations, new governments, or the crash of industrial society replaced by some utopia are all ineffectual “solutions” that ignore a central tenet of this book: that peak oil is a predicament, not a problem. There are no solutions, just responses, and ultimately a shift in expectations is needed as we move toward deindustrialization, an eventual social, intellectual, and spiritual predicament. Greer examines historical civilizations and their declines, the aforementioned myths and their root causes, the arguments of both lifeboat community and survivalist proponents, and the trends in transportation, medicine, leisure, and work that will occur over the next few hundred years of incremental change. Among those trends is a precipitous decline in health due to the current reliance on fossil fuels in the health industry. A practical response would be for each of us to reclaim management of our own health. Greer advises a paradigm shift away from the prosthetic society we have created in which we accept the slow demise of the industrial era, eschew the myths of progress or apocalypse, and begin to embrace a real notion of community, honing new skills such as organic farming and other practical skill sets. What does this mean for librarianship, especially when the electrical server farms have withered and we can no longer rely on computers? We'll certainly have time to recreate all those decommissioned or destroyed card catalogs! The return to an agrarian age that Greer foresees will likely mean an increased role for libraries as providers of a different type of lifelong learning. However, there will probably be fewer libraries and librarians. There will be hard choices in how our remaining finite resources are used. Greer wryly asks: “If it's necessary to choose one or the other, is the capacity to print books more or less important than the capacity to treat illnesses that herbs won't cure?” Information about organic farming, farmer's markets, reforging tools, and so forth will be indispensable and could be a vital part of library collections. At one point, Greer remarks that librarians are already struggling to preserve disintegrating collections of nineteenth century books, so what will happen as CDs and DVDs begin to disintegrate in a low-tech future? His prediction is a serious winnowing of books and other library resources into smaller collections that may some day require hand-copying. We could use our current industrial resources sparingly to cushion the transition to a future world of deindustrialized libraries, all the while planning our return to a reliance on human memory, thought, and preservation of materials, triaging existing technologies and bringing discarded ones back into the fold. The Long Descent is thought-provoking and, I believe, essential for its conceptual foundation and practical advice as we move further along the road toward the first phase of deindustrialization, the initial resource depletion crisis we will probably experience in our lifetime. There are several other good reviews of this book, including rebukes for its failure to focus more on the implications of climate change and endangered species, but general unanimity abounds about the importance of the themes discussed in The Long Descent. Our librarian descendents will inherit a slowly adjusting world. Our decisions and theirs about how to cope with energy resource scarcity must be discussed and injected into the communication within ALA and other professional outlets. SRRT Newsletter is published quarterly by the Social Responsibilities Round Table of the American Library Association. It is sent to members of SRRT as part of their membership and is available to others by subscription for $15.00 per year. Subscription is open to both members and non-members of ALA. ISSN: 0749-1670. Copyright � 2009 by the Social Responsibilities Round Table. No part of this periodical may be reproduced without permission. Editor: Myka Kennedy Stephens, mykaks(at)gmail.com. Book Reviews Editor: Jennifer Caldwell, Jennifer.Caldwell(at)pima.gov. Views expressed in this newsletter are not necessarily those of ALA/SRRT. The editors reserve the right to edit submitted material as necessary or as the whimsy strikes.